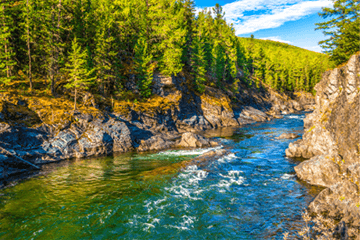 What is Applied Sound Therapy? Applied Sound Therapy is a way to restore integrity to cells, tissues and organs with sound waves. It is applied to the skin, like ultrasound, but its frequencies are in the audible sound spectrum, and there are specific combinations of frequencies for different problems. Sound therapy has a history of many decades of clinical success in the U.K. It was developed by Peter Guy Manners, D.O. (Doctor of Osteopathy). He practiced sound therapy (called cymatherapy by Dr. Manners) for more than 30 years at a large clinic and had remarkable results with thousands of patients. One of his principal students, Chris Gibbs, still operates three clinics in the U.K. To learn more about the way it is practiced there, see http://www.cyma-therapyclinic.co.uk. At present, we are the only practitioners of Applied Sound Therapy in the Chicago area. There are a few other practitioners in the United States at this time. What conditons are treated with Sound Healing? No, it is painless and non-invasive. The sounds are applied to your body with a small, convenient, speaker device. The therapy feels to most people like a very light, soothing vibratory massage. No, it is very economical. You only have to pay for a program once, and you can use it from then on. For example, some of our patients have had great success with the muscle sprain and strain program and have been able to pass it along at no extra cost to other family members if they have a diagnosis of muscle sprain or strain. Of course, we always caution everyone to see a physician and make sure they have a complete diagnosis before they use Applied Sound Therapy. Thermography is a key method for identifying inflammation with modern medical imaging. Thermography creates color images of heat levels in the body, which shows the severity of inflammation processes -- and can also indicate the level of reduction of inflammation after using a particular therapy. Inflammation appears as a red color on the Thermography scans, while cooler tissue shows colors towards the blue side of the spectrum. 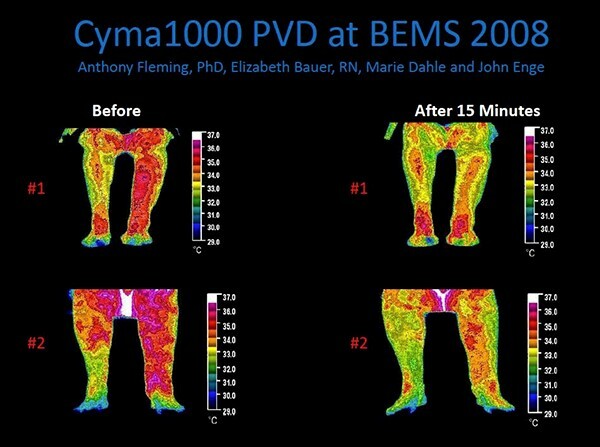 A major research project was undertaken with the earlier model Cyma1000 clinical unit. The project focused on Peripheral Artery Disease (PAD), which is a condition of the blood vessels that leads to narrowing and hardening of the arteries. The PAD Study was published and presented at Bioelectromagnetics Society (BEMS) 30th Annual Meeting in June 2008. 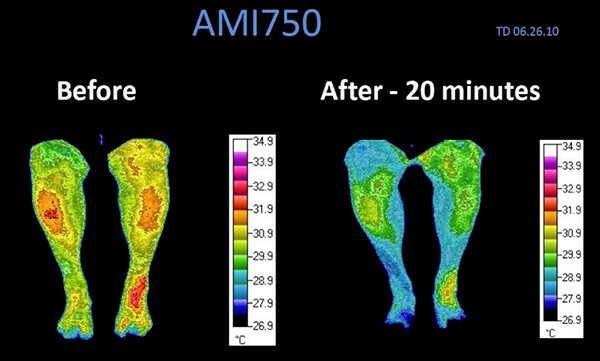 As seen in the pictures below, thermography reveals a stunning decrease in inflammation after only 15 minutes of application. The “Before” pictures are on the left, the “After” pictures are on the right of the image below. This type of anti-inflammatory result has been found in research on other parts of the body as well. 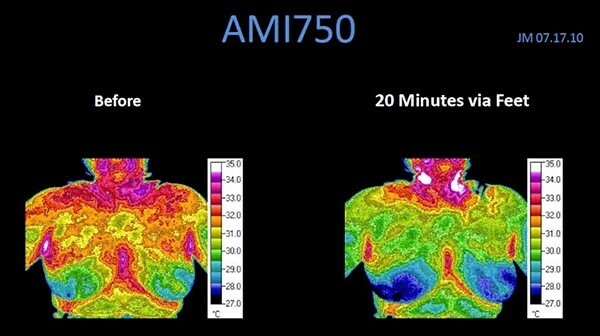 The image below shows the use of the new AMI 750 public unit in helping reduce inflammation throughout the upper body, including breast and lymph tissue, with the sound vibrations applied through the feet. The pictures below are of thermography studies of a case of Lymph and Breast Pain & Inflammation, with the Before pictures on the left side below, and the After pictures on the right side below showing results after a 6-week protocol of using the new AMI 750. Other research projects are ongoing, including recent projects with Alzheimer’s and with major Lung issues (COPD, emphysema) which are showing excellent results. Details of these projects will be discussed at upcoming Cymatics conferences to be held in the United States. To schedule your appointment with Chicago's leading Sound Therapy and Sound Healing specialists, please call (773) 219-1097 or contact us online today!